Considered to be one of the most beautiful beaches on the Danube, Strand is suitable for swimming and boating and features a plethora of recreational activities. Officially open in 1911, it has offered lifeguard service, swimming lessons, and modern facilities ever since. Indigenous sports developed at the site include picigen and kurendol. Head to this lushly landscaped beach for a swim or a drink, and stop by the many sports facilities, which feature basketball, volleyball, and miniature golf courts, as well as a rock-climbing area. Every year, the beach also sees the Danube regatta--the world's longest race of its kind. Discover how to plan a Novi Sad trip in just a few steps with Inspirock's itinerary builder. 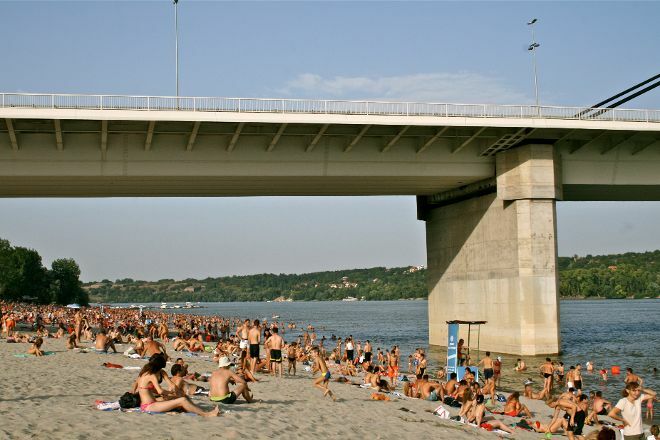 In Novi Sad's largest beaches are crowded during the summer. I think you place, café-bar and they had a drink, both adults and children are bright in the distracted admission. I heard that Einstein used to frequently visit on vacation. Very nice river beach. You can spend whole day in here. After dinner you can continue till late night in the local bars. Perfect place to spend summer in Novi Sad. There is a possibility to rent a dressing room, but you have small changes by normal application procedure. This beach looks awesome! I'm going to Serbia in January, I would love to go here even though it is cold. But illmmake sure to go on the summer and enjoy everything the beach would offer. Every day, we help thousands of travelers plan great vacations. Here are some tips on how to use your Listing Page to attract more travelers to your business - Strand. Promote your permanent link - https://www.inspirock.com/serbia/novi-sad/strand-a820921927 - on your website, your blog, and social media. When a traveler builds a plan from this page, the itinerary automatically includes Strand. This is a great way for travelers looking for a great vacation in your city or country to also experience Strand. Promoting your link also lets your audience know that you are featured on a rapidly growing travel site. In addition, the more this page is used, the more we will promote Strand to other Inspirock users. For best results, use the customized Trip Planning Widget for Strand on your website. It has all the advantages mentioned above, plus users to your site can conveniently access it directly on your site. Visitors to your site will appreciate you offering them help with planning their vacation. Setting this up takes just a few minutes - Click here for instructions.